揂fter Enrico Caruso, arguably no voice had a greater impact on the early development of the phonograph than Feodor Chaliapin. And yet, whereas Caruso has had his complete recordings issued in complete sets multiple times on LP and CD, the first edition going back decades, it is only now that Chaliapin has similarly been so honored. Thanks to financial subsidies from several generous underwriters, Marston has been able to spare no trouble in producing a monumental edition that is a veritable model which all subsequent similar projects must aspire to match, but few or none will even approach in so doing. The logistics of this set are astounding: 200 tracks containing 211 sides, all remastered from original cylinders or shellac disc sides, from the catalogs of several companies: Gramophone and Typewriter (18 tracks from 1902�), Gramophone (156 tracks from 1908�), Victor (16 tracks from 1922, 1924, and 1927), and RCA Victor (two tracks from 1936), plus transcriptions of eight private cylinders held in Russian archives and dating from about 1898�02. This compilation includes several unissued test pressings, plus a very few sides of choral scenes from BORIS GODUNOV in which Chaliapin himself does not sing but were recorded in the same sessions and are included for the sake of context and completeness. Need I add that, with Ward Marston at the console, the remastering of every item is pitched to an impeccable standard of excellence? The results, laid out in chronological and matrix number order with the private cylinders forming an appendix on the last disc, are presented on 13 very generously filled CDs. 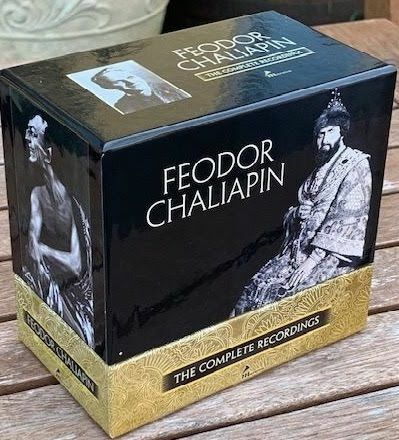 These are housed in six double and one single gatefold cardboard jackets, lavishly decorated with photos of Chaliapin and providing track lists with titles and timings. The jackets are in turn housed with an accompanying book in a heavy-duty laminated and similarly decorated cardboard box with a pull-off top lid. The CD-sized book is a veritable marvel: 324 pages, with sewn signatures rather than glued single sheets, printed on laminated paper and housed in a laminated heavy-duty cover. The initial 60-page table of contents - which provides composers, selection titles, recording dates and venues, names of assisting artists where known, matrix numbers, and timings - is followed by 68 pages of essays and reminiscences by Michael Scott, Gerald Moore, Ivor Newton, Tully Potter, and Ward Marston himself. The remainder of the book provides texts in original languages (Russian is transliterated) with English translations, plus names and dates of composers, titles and dates for the works in question, and informative notes where needed. 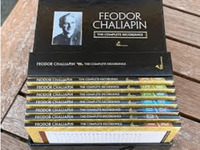 Interleaved throughout all this are literally hundreds of photos, posters, cartoons, and notes of and by Chaliapin, many provided by collectors worldwide. While Marston抯 genius presides over the enterprise as a whole, this set is truly a collaborative effort of many generous minds, hearts, and hands, all of which deserve our thanks. Chaliapin was one of the most arrestingly individual, as well as thoroughly schooled and deeply thoughtful, vocal artists of the previous century. Although trained in Russia by the tenor Dmitri Andreevich Usatov, Chaliapin was in fact through Usatov an heir of the authentic bel canto tradition; Usatov抯 teacher was the noted Belgian baritone Camille Fran鏾is Everard, who was in turn a pupil of the celebrated and exceptionally long-lived baritone Manuel Garcia II, the brother of Maria Malibran and Pauline Viardot and the inventor of the laryngoscope. Although Chaliapin would later become known for his pointed criticisms of bel canto singing, his animadversions were not directed against the technique itself but rather against its debased use for empty displays of vocal prowess rather than genuine artistic expression. From his training under Usatov (who, impressed by Chaliapin抯 raw talent, taught him for free and earned the basso抯 lifelong veneration), Chaliapin acquired the secure foundation and manifold facets of his art that he would retain throughout his long career: seamless production from the bottom to the top of his range, immaculate breath control, steady emission of breath and sound, precise intonation, clear diction and articulation, and fluid legato. While his voice was not a sepulchral 慴lack� Russian bass, it was richly sonorous, with a rapid but not fluttery vibrato, and a somewhat nasal coloration due to facial mask inflection. Although he did not have the sheer size and power of a Francesco Tamagno, he projected his voice with great facility and could cut through the most dense musical textures to make himself clearly heard. One special trademark was his ability to sing long-held high notes pianissimo. A noticeable feature of Chaliapin抯 discography is its relatively small compass and repeated recordings of certain items. Although the headnote for this review lists 42 composers, many of those are represented by a single selection, whereas a few names and titles predominate: Russian folk songs, Boito, Borodin, Glinka, Gounod, Mussorgsky, Rossini & Verdi. Sixty of the 200 tracks in this set come seven operas, with some selections being recorded at least six times. Similarly, although Chaliapin mastered a significant amount of folk song and Lieder material, his concert recitals as well as his records usually featured a small, select group of items over and over again. While Chaliapin was mercurial in temperament (he was famous for alternating between titanic temper tantrums and beguilingly winsome charm; his wife and the recording producer Fred Gaisberg were the two people who knew how to rein him in), he could sometimes be somewhat eccentric in his interpretations. Compare, for example, the two very different Victor recordings from January and November 1922 of King Philip抯 慏ormiro sol...Ella giammai m抋mo� from Verdi抯 DON CARLO, where in the second one he takes the central section at an almost absurdly fast tempo to express the monarch抯 growing emotional agitation. But he was never uninvolved or boring, and almost never slipped below the very highest standard of technical excellence. 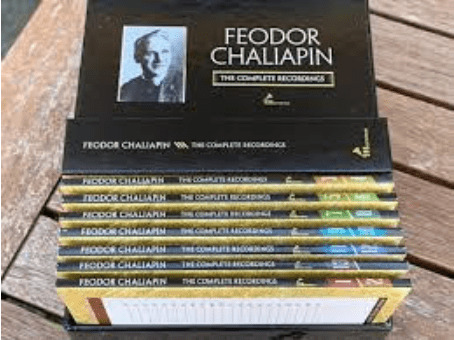 In this entire set, only most of the private cylinders (very hard to hear in any case) and the song on CD 1, track 1 (where Chaliapin appears not to be fully warmed up for his very first commercial recording session) failed to be of mesmerizing interest to me. Of striking interest is an unreleased side from 1922 in which Chaliapin recites, instead of sings, a text titled 慏reams� his inflections of the words are absolutely riveting, and revealing of the similar capacity evinced throughout all his singing. That he was a veritable stage animal is made clear by comparing his celebrated 1928 sides from BORIS GODUNOV recorded live on stage at Covent Garden; as superb as his many preceding studio recordings of excerpts from that opera are, those almost pale compared to the larger than life, transfixing power of him in actual performance. Still, if I were to select just one cut from this entire set for demonstration purposes of the scope and depth of Chaliapin抯 art, I would go to his 1921 recording of Mussorgsky抯 慡ong of the Flea�, where the array of interpretive devices and voice colorations brought to bear on elucidating the text is positively mind-boggling. "Chaliapin will never die; for with his fabulous talent, this marvelous artist can never be forgotten... To future generations Chaliapin will become a legend." "During the Russian phase of his career, Chaliapin was confronted with strong competition from two other great Russian basses, the black-voiced Lev Sibiriakov (1869-1942) and the more lyrical Vladimir Kastorsky (1871-1948). The fact that Chaliapin is by far the best remembered of this distinguished trio is testament to the magnetic power of his performances on stage." "Feodor Chaliapin's voice has a weight and force seldom equalled but with a baritonal vocal thread that allows his soto voce to make as powerful an impression as his full roar. He needs fewer of the histrionic effects than those who came after him, if only because he projects words with a force that comes with long-distilled dramatic truth."